Betty Chen works with students at BEAM during her DukeEngage Independent Project. 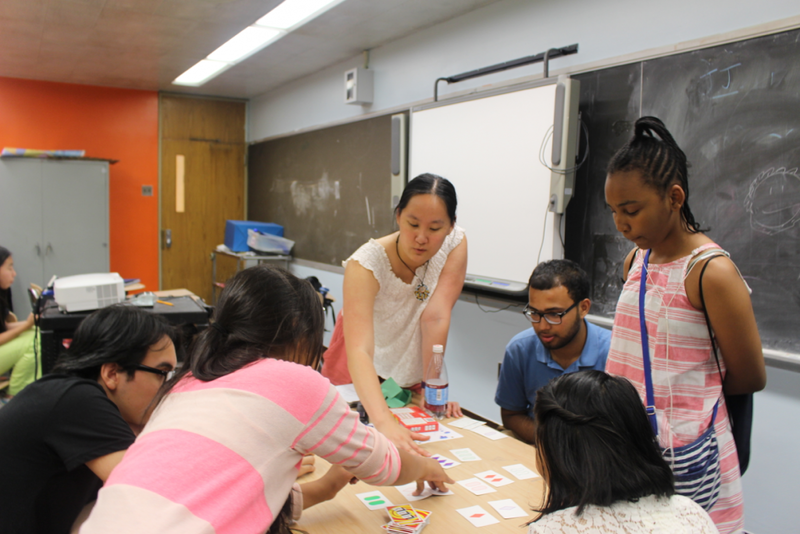 Earlier this year, the New York Times featured a piece on BEAM 6, a program that allows mathematically talented young students from low-income areas of Manhattan to attend intensive math camp during the summer. This past Summer, DukeEngage alum Betty Chen (Trinity ‘17) partnered with BEAM 6 as a program intern and Director of Student Life on her DukeEngage independent project. BEAM, or Bridge to Enter Advanced Mathematics, works to help launch underserved youth into careers in STEM fields. The New York-based program brought 76 students from low-income areas together to hone mathematics skills and face challenges in creative problem-solving. While there, Chen developed a transportation system to be used by all students, and organized communications with families prior to the program’s start. Once students arrived, Chen worked alongside the rising seventh graders to explore areas of math, and to coordinate non-academic activities. Chen was excited to see the NYT article come to fruition, sharing her gratitude for the DukeEngage program. “There is nothing I am more proud of than what we were able to create at BEAM 6 last summer, and I could not have done it without DukeEngage’s funding and support.” Click here to read the full New York Times article.